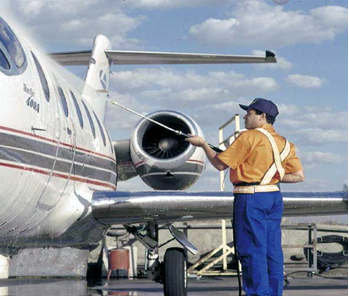 Davies “ Aero Wash N Wax” is a chemical breakthrough in liquid aircraft wash technology. It makes it possible to thoroughly wash and wax your plane in one operation! “Aero Wash N Wax” first scrubs the vehicle clean, and then leaves a protective wax coating. This amazing chemical discovery simply hoses to a bright luster, no chamoising is required, just apply with a sponge or soft brush, and hose it off. “Aero Wash N Wax” is recommended for all types of finishes. It rinses easily and quickly, and is the perfect time saver. Dissolve approximately 4 oz. for every gallon of water. Usage may be decreased or increased depending on the severity of the soil load. Please call (800-888-6133) or email for pricing.